Over the past two years we at Production Expert have had the opportunity to review some of the new wave of audio interfaces from the team at Antelope Audio. Antelope have been on a mission to give us every possible combination of interface form factor, Mac and PC connectivity as well as analogue and digital I/O and it’s true to say there is a lot of overlap when it comes to features. 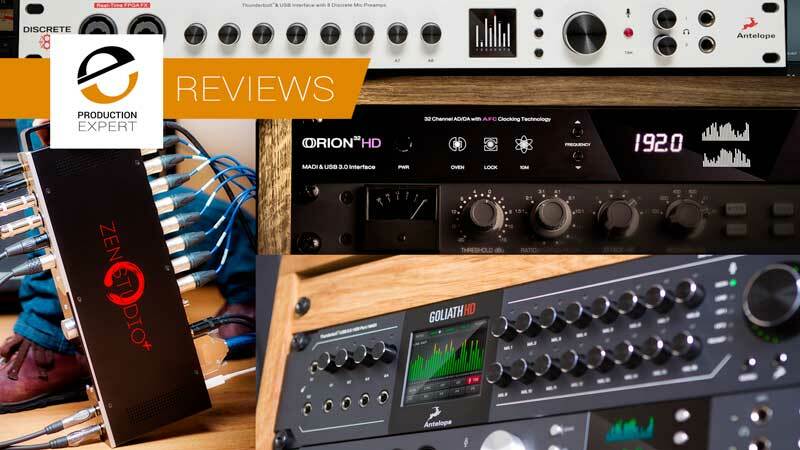 So if you are in the market for a new hub for your recording studio, take a look at six of the Antelope Audio hardware interface reviews. In this video James Ivey from Pro Tools Expert takes a look at the Orion Studio, a 1U rack USB and Thunderbolt audio interface from Antelope. It should be noted that in just two years since the original Antelope Orion Studio review, this unit has been up-dated twice. First to the Orion Studio 2017 then to the Orion Studio HD, which also offers Avid Mini-Digilink connectivity into the Pro Tools HD workflow. As a rule I have found the Antelope Audio interfaces to be very feature rich devices and by that I mean any one of them could be the centre of your studio world depending your exacting requirements. I have even put my money where my mouth is and bought an Orion32HD for my studio and use on a daily basis alongside by Audient ASP8024 console. I will admit to having the occasional “issue” with the Antelope drivers, not from a point of stability with my DAW but from a point of getting the Software GUI to run on the machine my Orion32HD is linked to. This does not effect the operation with Pro Tools but can be an issue when I want to change the routing or get clever with patching between digital and analogue I/O. This is a minor inconvenience and does not stop me working, which is why we buy interfaces of this quality and all the Antelope interfaces I have tried have been very well built and have a very high end feel to them. I hope you found this roundup useful and I will be pulling other ranges of hardware and software together for another roundup very soon. For more on the Antelope Audio interface range check out their website. More Antelope Audio content from Production Expert.